I just came upon this letter written by David D Williams to his sisters in Wales. In it he describes his trip to Utah from Wales. The letter was originally written in Welsh. I have written of David and his immigration in his biography. As mentioned in the history, David is the son of Frances Henneys and John Williams born in Wales in 1832. He immigrated to Utah in 1864. 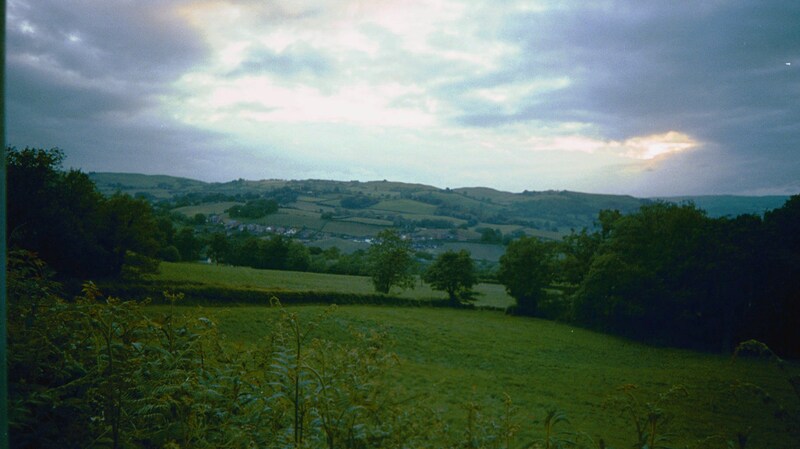 I am including a picture of some rolling hills in Southern Wales that I took with some friends in 2003. Funny how he thinks how beautiful Utah was (then), and yet we feel the same about his Wales! I have reached the end of my journey in the valley of Great Salt Lake well and happy, and I hope that you are the same. I shall now give you some of the history of my trip from the Old Country. This little letter is not large enough to describe all I saw, but I shall do my best to describe the outstanding features as briefly and inclusively as possible. We started from Aberdare on May 17th for Merthyr, where we stayed overnight. Next morning, the 18th, we started for Liverpool. After leaving the old rugged, craggy mountains of Wales behind us, we came to the flat plains of England and there saw the most desirable land such as we had never seen in all our lives. It was full of apple trees, plums, pears, and all kinds of other fruit, nature was a feast of beauty, all kinds of beautiful buildings of red brick. By evening we reached Liverpool. (One-half dozen words obliterated by creased paper) the streets were all paved. There is no time now to give details about this place. Next day we went down to the docks, and there we saw the General McClellan. This immense vessel laid about 70 yards long carrying 2000 tons. After getting everything in order, the steamboat pulled us on to the river, where we saw the great eastern, the world’s chief wonder. May 21st, we set sail for New York across the Atlantic Ocean. We saw many large fish. About the banks of Newfoundland we saw many large icebergs, some of them 200 feet high, and the portion above the surface of the water was but a third of the whole, so this enormous block would stand 600 feet high if it were all visible. We had a successful journey. We got one bad storm for about 24 hours. We were on the ocean for a month and 3 days. After reaching New York, we were taken to customs offices where all immigrants have to pass. After getting all in order there, we started out by steamboat on the river Genessee for about 160 miles to Albany. Here we took the train, and away we went for hundreds of miles along the borders of Canada. Then we crossed the river to St. Clair and through a part of Canada, then recrossed the same river to the United States and on to Buffalo. Here laid a large lake called Buffalo Lake. I don’t know its size but it was scores of miles long. After changing trains, we went on to Quincy. This lies on the bank of the Mississippi River. We crossed this river to the State of Missouri. Here is the most delightful land we ever saw, vast plains for hundreds of miles. I did not see a single mountain during my journey from New York to Wyoming (in Nebraska). We went along the banks of Mississippi for about 900 miles to St. Joseph. This was as far as we went by train. We were on the train for 11 days and nights, and were very tired for want of a place to sleep, having traveled 2000 miles. From here we went by steamboat on the Missouri River for 200 miles to Wyoming, and here we came to the plains. We stayed in Wyoming for 3 weeks. July 21st we started over the plains, a company of 500 to 600 people, men, women and children, and about 80 wagons. After traveling on the plains for about 11 weeks, we reached the City of Great Salt Lake on Oct. 4th. This is the most beautiful city I ever saw in my life. It is full of apple trees, plums, pears, peaches, damsons, grapes, melons and all kinds of other fruit. The buildings are large and beautiful, and you seldom see a double house, but each house separate with a garden adjoining. The streets are all straight for miles, not a crooked street in the city. I stood by Brigham Young’s house facing the south, and I could see 20 to 30 miles of perfectly straight road. We can see for 80 miles here better than you can see for 20 there. After being here several days, I learned that father and my brothers were in Ogden City, 40 miles away, and that Richard is coming down to the festival (conference). This gave me no small amount of joy, for this was the first news I had of my father that he was alive. I saw Richard in the city, and when the festival was over, we started for Ogden City. John has moved out 200 miles from here, and he and his family were well when last heard from. Father is well and contented and he was as glad to see me here as I was to see him, and to hear that you are all well there. They want you to come next time and would love very much to see you. This is three times as good a country to live in if you care to work. I know that Sally is unable to come without help, but if Mary is able to come if nothing untoward has happened, and I would advise you, Mary, to come out next time, so we can later help Sally and her family. I would like to know whether or not you intend coming next time so I can give you a few instructions. It is a great country if one is wise to take advantage of the elements, and to do everything for one’s self, for which I can greatly commend these people, more so than the people of the old country. The women make all their own clothes – weave, roll, and everything; it’s a poor place for a tailor to live on his trade. They also make soap, candles, vinegar, yeast and everything for their own use. These people raise the material for sugar, and make molasses like the tressels you have, except that it is much better. The sugar is all in this molasses, and the refuse that comes from this is what you have for treacle. There is nothing else in particular that I can add at present. Father sincerely sends his regards to you, to his old neighbours, and to all the Saints, and hopes to see some of their names in the paper as immigrants the next time. Richard sends his regards to you and to all the saints and his acquaintances. Give me an answer as soon as you can, so I can have sufficient time to write back if you should come out next time. If you want to know anything, ask in your letter and I shall answer it with pleasure. This briefly from your dear father and your brothers, John, David and Richard Williams. Please give this letter (accompanying this one ) to William Rees. A few words to William Rees, my brother in the gospel. I have taken my pen in hand to send you a few lines, hoping you are well and happy, and enjoying the comforts of the gospel, as I do myself at present; and I thank God for that. I intended to give you a little news of the plains and its creatures. But from what we hear, it is not likely there will be an immigration over the plains for some time, because the Indians are rather cruel and are at war with the United States. We were on the plains for 11 weeks because of difficulties. We joined another train (wagon train) and in all we had 150 wagons with about 1200 people; our train was about 4 miles long. The last train of saints came to Salt Lake City on Oct. 20th. Trains of gentiles had joined them along the line, and I heard people saying that they stretched over 10 miles while traveling. Eighty of the rich people of Salt Lake City were called, last festival (conference) to go south 600 miles and raise cotton, and the rich everywhere are being called on to help; and there is also a widespread call for people to go there to settle. They are going to build ships on the Colorado River, for that is the way the next immigrants will come, around the Cape Horn. I have to finish at present for want of space on this paper, with fond regards to you, to Thomas Griffiths and his family, to Mary Hoskins and her family, and to all the saints alike. This briefly from your old brother in the Gospel, David Williams.